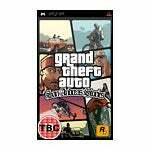 You may have seen today a retail listing for a PSP game called San Andreas Stories. It's even got box art. Pity, then, it's all the result of the result of some wishful thinking.